A fitting quote for both Ireland Craft Beers and Irish Film Board London, on what has evolved into a growing partnership for the export of fine Irish arts & craftsmanship. The Irish Film Festival London kicked off proceedings at the Regents Cinema on Wednesday November 18th 2015, opening with a fantastic documentary on the life of W.B Yeats, a foremost figure of 20th century literature and a pillar of both the Irish and British literary establishments. This was followed up with five fantastic evenings of some of the finest Irish theatre screenings of 2015. 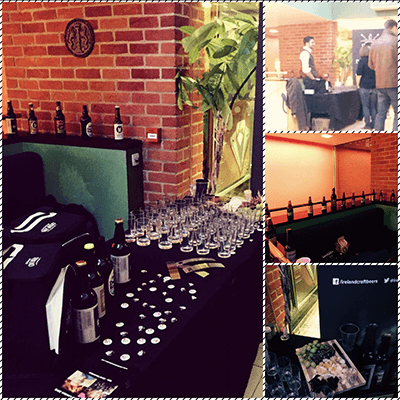 As one of many sponsors for the film festival, we had the pleasure of hosting an Irish Craft beer & cider tasting on the closing night of the festival, alongside the UK premiere screening of ‘Older The Ireland’ and the film ‘You’re Ugly Too’ starring ‘Game of Thrones’ Irish actor Aidan Gillan. We had our full portfolio of Irish beer and cider ranges at hand for our London film fanatics, along with cheese boards to accompany some souvenir give aways on the night. One of the highlights of the evening was without a doubt having the privilege to serve the Director of ‘Older Than Ireland’, Mark Fagan. He was a big fan of Jack the Lad from Reel Deel Brewery which happened to give him a bit of dutch courage before his Q&A session after the film. Another highlight of the night, was Mark Noonan, the director of 'You’re Ugly Too', dropped in to say hello before his Q&A along with young actress Lauren Kinsella. One of the biggest take aways from the evening was making so many of the local Irish people in the Kilburn community aware that they can now get these fantastic home brewed Craft Beers and Ciders within their area. It was great seeing some of the older folk that have lived in London over 20+ years have such homage to beers from their home village; most not wanting to try samples from anywhere else but their home county ! The audience also loved the food combinations with the beer such as grape, cheese and dark chocolate, accompanying our Milk Chocolate Stout, Heather Sour Ales and fantastic hand pressed Dan Kelly's Cider. It seemed to be only positives on the feedback from all beers and ciders on show for the evening, then again they were all free samples ! Being able to show case all these fantastic Irish beers and ciders to film fanatics across London, and spend time telling the great stories behind each one, Before sitting down and watching some of great Irish screenings showcasing that evening. All samples went down a treat with everyone wanting more before the night was over. We very much look forward to working with Kelly and her team going forward on future events and showing both new and upcoming Irish craft beers, cider and film down the line.